The core members of the DARC smelt team (Neil, Kevin, Dave and Ken) were up over the past weekend. We discussed what we are learning, what we have done, and what direction this year's campaign at the smelter should take. The main thrust will be work towards the reconstruction of the Icelandic grass sod smelter. At present we have two pieces of technical work to refine. The first (not dealt with there) is the creation of a workable bog ore analog. The second is to finally get an effective bellows design. 1) Neil has ordered a copy of the small blacksmith's bellows for his glass bead furnace project. This will be made up using the current physical measurements, but with two important changes. - First the bag will be cut with only two leather lames - giving a maximum loft in use of 30 cm. This will reduce the folding of what is just unused leather surface. The wooden frame will be made up, and then a fast test bag will be made up out of taped plastic. This should allow for a fast test series to be made to measure the air volume with the shorter bag. - If this test proves effective, then the bags will be made up using a lighter (likely deer skin) leather than has been used on previous versions. - The centre seam will be fitted with a more rigid metal hoop than has been used in the past (at least 3/16, if not 1/4 inch round steel rod). Taken together, this new unit should allow us to record more accurate numbers for the possible use of the historic patterned bellows in smelting. 2) A second 'test bed' bellows will be made up (as seen in the illustration above). - Measurements for this bellows will be determined by taking a theoretical model which is able to produce roughly 1500 LpM. The desired working air volume is actually 1000 LpM. Numbers and images from Jens suggests a true working efficiency of about 2/3 theoretical is likely (assuming good design). Working from more theoretical and experience proven volume requirements, our current run of furnaces work best at roughly 500 to 800 LpM. - The sides of the bellows will be flat surfaces. This allows us to hold the bags in place with metal strips held with screws. This permits easy modifications to the interior of the bag and plates if required. - The bellows plates will be cut and fitted with intake holes on both top and bottom. In use, either side can be sealed using a metal cover again screwed into place. In this way the difference between top and bottom mounted air valves can be compared. 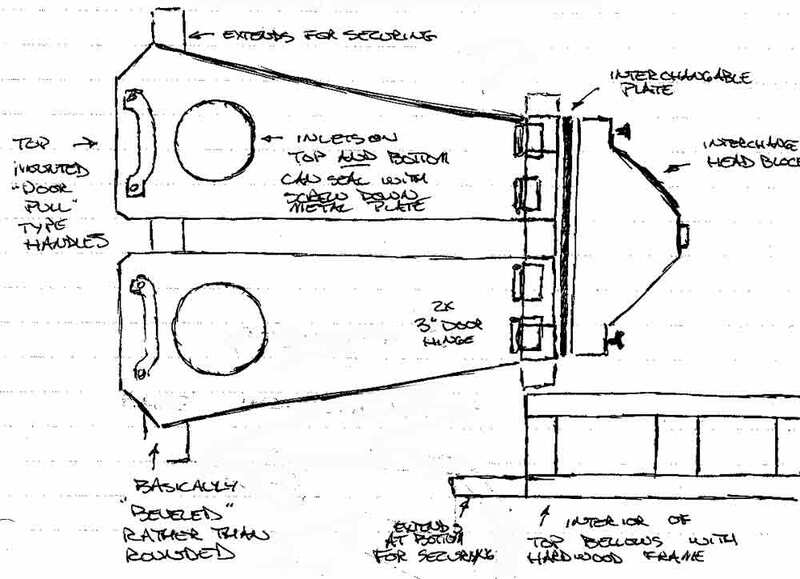 Physical mounting systems for the bellows, and how this relates to operator strain can be compared. An extension of this is further recording of the related debris fields. - The distance at hinge point of the bellows will be greatly increased, at least double the current measurement. This will allow the installation of two door type hinges on each plate, greatly improving durability. - The head block of the bellows is a simple boxed shape. To this can be screwed a removable, even interchangeable, exhaust unit. Different types of valves, port shapes and tube diameters can then be attached to measure their impact on flow. - The handle for the operator will be a wide wooden D type. This will be mounted directly in line with the bellows hinge axis. Most of the tests involved are primarily static tests, or short applications of human power to the existing air pipe system. There was more interest than I expected in conducting a full smelt using a proven bellows for air. With a proven smelt (bloom production) DARC will have a certain 'all Norse' demonstration possible. We have recently received a few emails from various folks asking about meeting us or hiring us. I thought I would offer a couple of quick suggestions. If you are with a museum and would like to mount an exhibit on the Vikings please contact Darrell Markewitz at darkmuseum@warehamforge.ca. Darrell will be happy to discuss with you the ways in which DARC or various members of DARC can aid you, some options for travelling exhibits, or some of the issues involved with creating a custom exhibit. If you are with a school and would like to arrange a visit to your class please contact Neil Peterson at darkeducation@treheima.ca. Neil will be happy to discuss options for classroom visits and costs. Please note that we have members across much of Ontario and thus we may be able to provide a visit depending on member availability. Outside of Ontario the travel costs can wind up being very significant. Finally for those of you who are interested in Norse re-creation. DARC has no groups outside Ontario Canada, nor are we looking to start branch groups. We suggest you join the Norsefolk_2 mailing list on yahoogroups, and ask there. There are many recreation groups around the world, perhaps there is one close to where you live. If you are in (or will be visiting) Ontario and would like to meet up with us the easiest way to do so is to drop by and chat while we are at an SCA event. In this environment we are more relaxed, with time to talk. Each year members of DARC teach at Forward into the Past (Kitchener in April) and appear at other events. Check out our calendar on the side of the blog for our most up to date schedule - then drop by and say hi. I have been doing some background research into air delivery systems for Pre-Conquest, mainly in relation to my ongoing experimental iron smelting. As well, I have worked with a fair number of modern and historic forge set ups. On a recent NORSEFOLK2 discussion, here have been some suggestions given about possible air systems for use in the forge. Right off the top, you have to determine if you attempting HISTORIC or MODERN equipment. 'Double Bellows': Two chambers, one beside the other, separate exhausts connected by a Y tube. Alternate filling and exhausting each side to produce constant blast. Evidence suggests individual chambers roughly 30 cm wide x 50 cm long. ONLY documentable system for the Viking Age. 'Great Bellows': Two chambers, one on top of the other. In northern Europe, typically a top mounted leaver pumps the bottom chamber, which in turn fills the upper chamber. From the upper chamber air is delivered to the forge. May vary in size, but typically very large, on the order of 50 cm + wide by 100 - 150 cm long, thus not portable. 'Box Bellows': One large rectangular box with a central plate which can be pulled/pushed back and forth. Valves on both sides, so as one side fills the other exhales. Can vary considerably in size, from about 30 x 30 x 60 cm to several metres. Asian ONLY - never used in Europe. 'Skin Bag': One or two individual leather bags with some method of closing an open top, the lower edge leads to forge or Y tube. I have seen either two sticks or a plank with a central hole and hand strap used to control this. I have seen a kind of concertina bellows set up, which may date back to the 1700's. Other systems in use by modern blacksmiths ALL date no earlier than 1870's. There are a number of posts discussing the development of a re-construction Norse era forge set up over on my own blog (Hammered Out Bits). If you are attempting an actual recreation of Norse smithing equipment, your only option (based on evidence) is a charcoal side blast forge using a double bag bellows. Used correctly, this small scale set up will produce welding temperatures. The main hurdle for the modern smith is learning to work inside the limitation imposed by the much smaller heat zone created. A reconstructed Viking Age forge will only heat about 4" or so of your material to correct forging temperatures, so you need to work quickly and efficiently. Images off the DARC web site - at Haffenreffer in 2004.